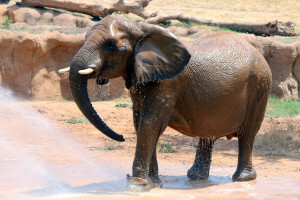 Never before used “Fitbits” track elephants’ movements | Dallas ZooHoo! 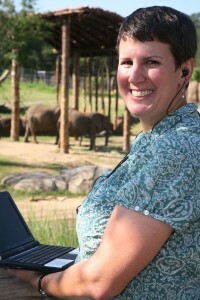 Nancy Scott, Dallas Zoo’s coordinator of elephant behavior science. Nancy Scott, Dallas Zoo’s coordinator of elephant behavior science, guest-blogs on ZooHoo! If you’ve been to the Zoo in the past few years, you may have noticed that the elephants wear a soft, canvas “bracelet” around one of their front feet. It’s usually caked with mud and blends in well, so you may not have spotted it. But what does it do? What’s it for? When our Giants of the Savanna exhibit opened in 2010, it looked great. The elephants and other species were more active and using all of the features designed in the space – swimming pools, mud wallows, scratching posts, shade structures, log piles. But we also wondered if there was a way to measure how the elephants were using their new home. 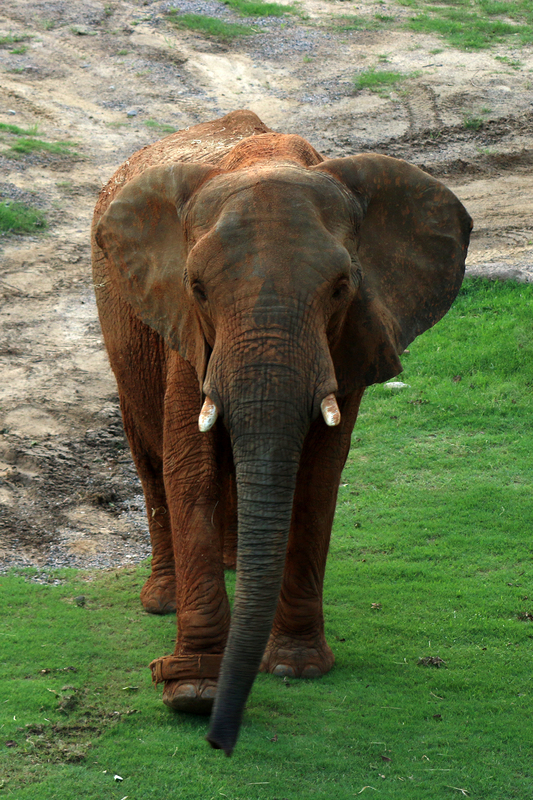 As coordinator of Elephant Behavior Science, I manage all sorts of elephant research projects at the Zoo. As much as I love sitting in the observation towers and watching the elephants, I can’t be out there 24/7. How could I collect round-the-clock location data AND keep track of daily elephant behavior AND watch how the elephants are getting along with the giraffe, birds, and hoofstock in North America’s only mixed-species elephant exhibit AND still have time to eat and sleep? Gypsy wears her RFID bracelet while enjoying a shower in the Savanna. Well, we decided that a remote, real-time system using active radio frequency identification (RFID) tags would give us the immediate information we need. But no one had ever done this before with elephants. Or with any other animal. Ever. Challenge accepted! Passive RFID (microchips) are used to keep track of your pets and library books. But those receivers need to be really close to the chip to read the signal. Active RFID has been used for inventory tracking to monitor where boxes are in a warehouse, but this is totally different. Boxes don’t move often. Elephants move a lot. We had to do a lot of software development to make the Zoo’s system more user-friendly. PathTracker image shows the elephants’ movements in one hour throughout the Savanna. Now we can collect location data in real time and see the results as they happen. The computer calculates totals and averages of how far each elephant travels and their average speed, and also produces cool pictures of where they’ve been over time so we know what parts of the habitat each elephant really likes. For instance, Congo doesn’t mind being by herself and will wander over to the giraffe yard to make sure there’s no leftover ostrich food. Kamba likes to cross the river and eat hay in the area the keepers fondly refer to as “Kamba’s Corner” near the viewing tent. The data is collected from RFID tags worn by the elephants in those fabric bracelets. The bracelets don’t bother them – it’s like you wearing a wristwatch. The elephants wear these bracelets anytime they go outdoors, rain or shine, day or night. Kamba and Congo’s bracelets have seen many muddy days. Each tag sends a signal every 6 seconds, telling a computer where the tag is located in the habitat. The computer generates graphs and tables of data for me to look at. The tag is smaller than a cell phone and keeps track of an elephant’s location and speed in the habitat – like a Fitbit for elephants. Batteries inside the tag allow the signal to travel all the way across the exhibit (much farther than the RFID signal in your car’s Toll Tag) to the receivers around the perimeter fencing. Next time you’re at the Zoo, look up at the roof of the Simmons Safari Base Camp. You’ll see two of the square, black receivers mounted on the thatched roof. Then look across at the observation tower. Do you see the two mounted there? As long as 3 or more receivers detect the tag signal, the computer knows where the elephant is and saves a data point. The soft canvas bracelet is camouflaged in the red mud coated on Gypsy. 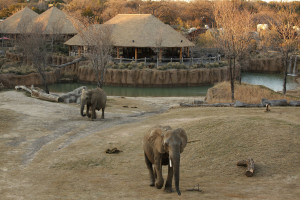 The Dallas Zoo elephants aren’t under the same stressors as wild, migratory elephants are, since we provide them with water, food and shelter. However, we still want to be sure they’re active and fit. I like to compare it to human behavior in a hotel room or a 2,500-square-foot house. If you’re lazy, you’re just going to sit on the couch and watch TV, no matter how big your space is. But if you have stuff to do, you’ll be active and move around your house or leave your hotel room and explore the city. We’ve provided the elephants with a larger space that they find interesting, so they want to walk a lot. 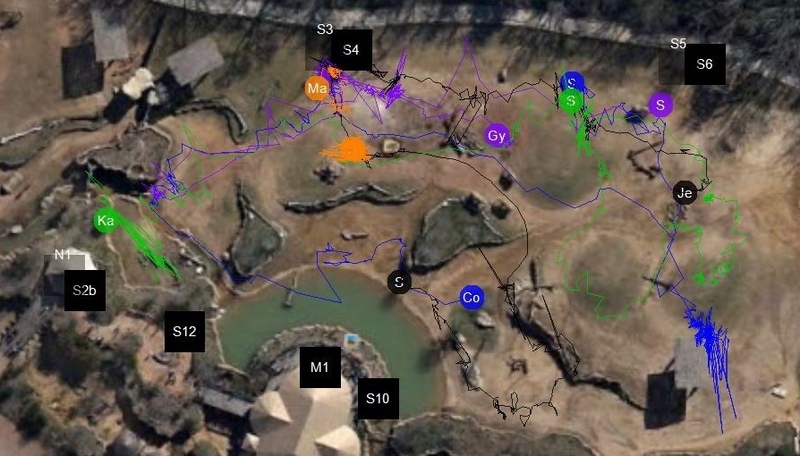 The RFID data shows the elephant keepers that the mud wallows, browse and hanging hay nets they set up every day motivate the elephants to explore the habitat more. For zoo exhibit designers, the data shows that creating a complex habitat like the Giants of the Savanna is beneficial to elephants. As a person who studies behavioral ecology and social interactions in animals, the data answers interesting questions for me, like whether the elephants move around differently when they’re with other elephants or with giraffe and other species, who they like to hang out with, and if there are changes with the weather. We’ve learned that the elephants, on average, walk more than 10 miles a day. On cool days, Congo travels nearly 17 miles a day! Congo strolls through the Savanna at sunset with Kamba close behind. I refer to her as The Great Explorer –always wandering around and searching the entire habitat. She’s the first one to head over to the North Habitat when the gates are opened on a mixed-species day. Gypsy is pretty confident, too, but Congo really roams! I’d definitely call them our two best walkers. And not surprisingly, each elephant walks more when it’s cool than when it’s hot. On hot days, they spend more time swimming in the pools and mud-bathing. When it’s cool, they spend more time exploring the habitat. Either way, I’m happy to report that they are behaving like elephants and using the habitat to their advantage! Currently I’m working with a group from the University of Texas at Dallas so that everyone interested in the data can better access it – including you. In the future, you’ll be able to see data for yourself and maybe even put your scientist hat on. Ask your own questions! Who is your favorite elephant? Want to know how far Congo walked in 2015? Let’s find out together. What an excellent idea! I’d so love to come to the Dallas Zoo (I live in Sacramento, CA) and see this in person, but the future data program that I’ll be able to access and watch is the next-best thing! Our local zoo is too small for this type of habitat except on a smaller scale, but it is so fascinating to see programs like this become more common in the future. Great job, Dallas Zoo! This is really cool science! However you are mistaken about no one ever doing this before. 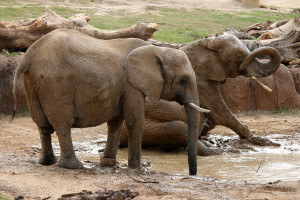 The San Diego Safari Park in conjunction with Elephants without Borders has been using anklets on calves and collars on adults since at least 2010 and maybe even 2009. I’m excited about this program and seeing where it goes in the future.